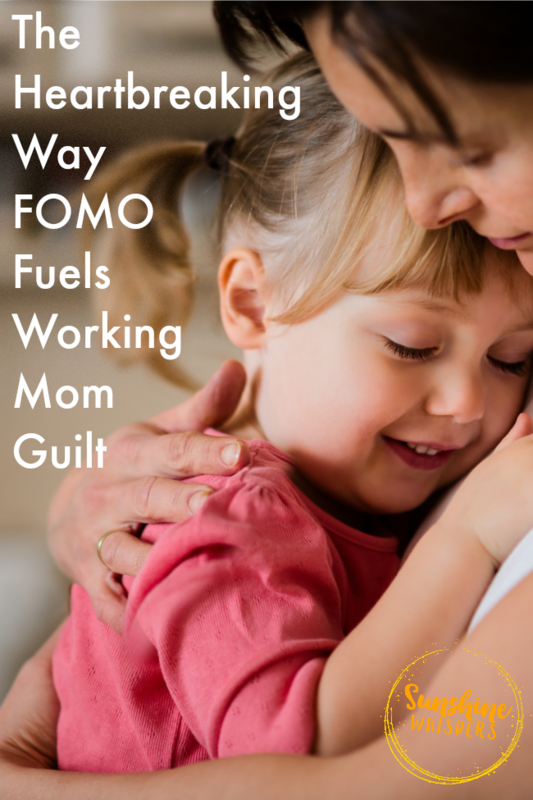 FOMO Fuels Working Mom Guilt but it is not the end of the story. 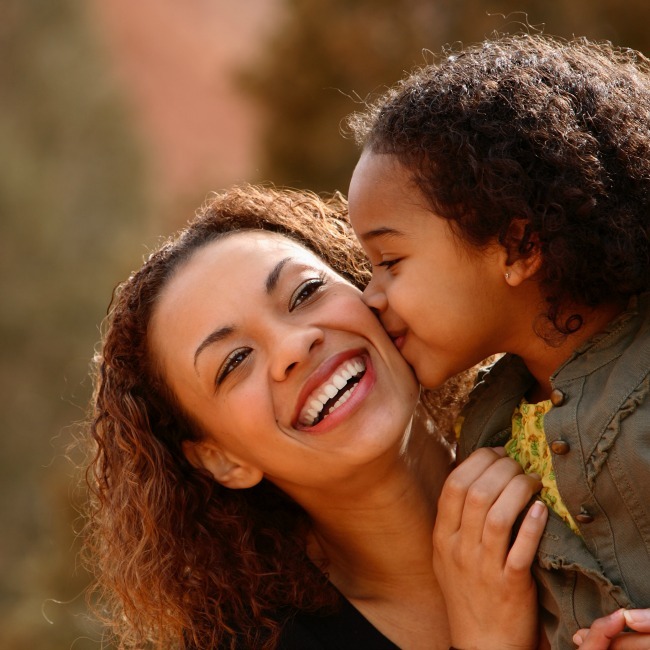 There are many ways a Working Mom can connect with her kids. It was a typical weekday evening. Our family had just finished cleaning up from dinner and my daughter was quietly playing with her ‘babies’ in the family room. I sat at the kitchen table to look through the pile of papers that were sent home from school that day. Having just turned 2 years old, my sweet little girl had recently graduated from the infant program at her childcare center and was now in ‘Discovery Preschool,’ — the 2’s program. Sitting in front of me was a huge envelope, bursting to the seams with examples of all the activities she had done throughout the infant program. It represented her growth from 5 months old through her second birthday. As I sifted through the contents of the envelope my heart caught in my throat a little and I started to tear up. There it was– evidence of all the great and wonderful activities my daughter had participated in since she started school and I started back to work. Painting with tempura paint, with sand, with watercolors, and with food. There were projects involving crepe paper, construction paper, and feathers– using not only brushes but also items such as corks, sponges, fingers… and sometimes her entire body. There were also pictures of my daughter role playing, dressing up in various costumes, playing in all sorts of sensory-rich activities. The artwork was there as a testament to the amazing care and education she had received, many times with a description of the activity and picture of her creating the artwork attached. I should have been thrilled.. and I was. I still am. However, my first reaction was to cry. My first reaction was a sense of loss. This is not guilt per se… it isn’t about me feeling guilty that I work outside the home and my daughter goes to school. It is more a sense of loss that while I am working outside the home, she is having many amazing, sensory-rich, fun experiences… and I am missing many of them. It is the feeling that I am missing out on the magic of seeing my beautiful little girl blossom into the person she is going to become. The sense that miracles happen in the ordinary and our ordinary is relegated to a few hours in the evening during the week and the weekends. As a Mom who works outside the home, I am sure you have experienced these feelings too. Do you ever get the sense that it doesn’t seem socially acceptable to own up to these feelings.. almost as if by admitting that we are missing out on something special, we invalidate our decision to work outside the home. Or conversely, by admitting this feeling but continuing to work, we forfeit any right to complain? Well, neither of those choices are acceptable to me. I love my daughter with all my heart. I work outside the home, not just because I need to, but because I want to. At the same time though, I do feel a sense of loss, a profound sense of loss, regarding the experiences I will not share with her– and there is nothing wrong with that. Ultimately, it all boils down to choices and perspective (doesn’t everything?). There are many benefits to Moms working outside the home. Parenting and child rearing are not a zero sum game or a wacko dichotomous universe where there are only good and bad choices, black and white decisions. Just about every decision a parent will make has pros and cons (which is why I loathe ‘Mommy Wars’ almost as much as I detest the smell of toddler diapers), and there are as many valid parenting styles as there are parents. The care and education most kids in childcare centers receive really is top-notch. Ultimately, it is the fact that our kids have these experiences that counts the most. It doesn’t really matter if they have all of them with Mom and Dad. If I quit my job to stay home and be a full time care provider, there are no guarantees that my daughter would then be immersed in enriching sensory experiences. There are some amazing Moms out there, who are fantastic about filling their kid’s days with crafts, nature walks, music, etc… That is the pinnacle of Mommy awesomeness. But it is also an idealized view of life as a full time care provider. There is a certain amount of grace in the space between the ideal and where reality lives. So, is that it? Do Moms who work outside the home just resign themselves to the notion that their kids will have these great experiences, and they will miss out on most of them? Of course not! I don’t think being a Mom who works outside the home means you miss out. Just as with all of the other decisions you make about how you will raise your kiddos, you have a ton of influence. You are still the Mommy! You will always be Mommy. It doesn’t matter how amazing your child’s childcare is, the emotional connection your child has will be with you! Your child doing an art project at school is just that.. an art project. However, if you do the same art project with your child at home, it is not just a project, it becomes a cherished memory. Isn’t that awesome? How do you capitalize on that? Well, remember those evenings and weekends I mentioned earlier? Treat that time as prime ‘memory maker’ time. Decide to make those activities and that time special. You may not be able to do 20 craft projects a month with your kids, but you could probably manage a few. You may not be able to take daily nature walks, but you can plan to do something special just about every weekend- like visiting a park, museum, or seasonal festival. The thing is, if you view your time away from your kids through the lens of what you missed out on, you would understandably be devastated. The reality is that if your family treats the time you have together as sacred, you will tend to make the most of it. In the process you will make many memories through the shared experiences you do have– enough memories to have a profound impact not only on the life of your kids, but on your life as well. In the meantime, just be thankful your children have the opportunity to experience so many wonderful things at school. Perhaps you can even use a few of their ideas as inspiration for your own Mommy-inspired fun. I know I will. So, pass the paint and paste! I have some memories to make! Would you like some ideas for easy ways to create special memories with your kids? Check out this FREE Connect With Kids Quick Guide. It lists a ton of quick and easy ideas for fun things you can do with your kids today! A delicately balanced view of life with Sweet Pea as her Mommy and working Mom, beautifully crafted. How about the guilt I feel over not feeling guilty that I don’t want to do such activities with my kids?